We ensure that quality comes prior to everything else. We employ special quality measures and checks at each stage of production. Our team of experts follow TQM (Total Quality Management ) program to achieve excellence in all processes. Implication of TQM program assures conformity with conventional international quality standards. Accredited with an ISO 9001:2008 certification, we are committed to provide world-class customer satisfaction through excellence in processes. We have a team of quality control officers to insure maintenance of quality, right from production to the completion of dispatch of final products. We have occupied leading position in industry by ensuring about quality maintenance and sound manufacturing facilities. ISO 9001 : 2008 - This standard certifies that consistent business processes are being applied throughout the company. We have state-of-the-art products, services, processes, materials and systems, and managerial as well as organizational practices. 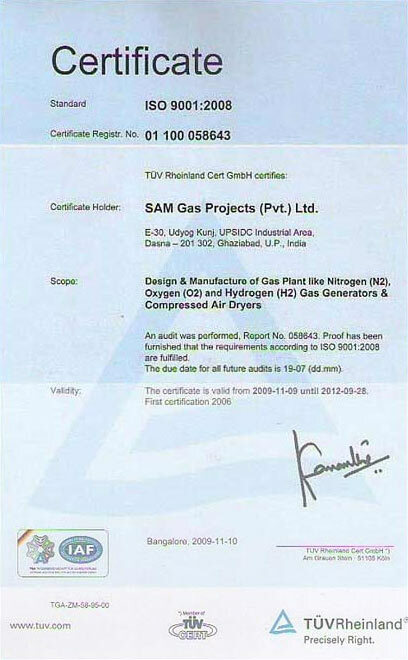 We have been successfully assessed against ISO 9001 : 2008 standards. Maintaining the highest standards of ethics and business conduct, and operating at all times within the laws of the countries in which we do business. Identifying and responding aggressively to new opportunities and committing to success in each undertaking.